I just returned from a two week vacation in New Zealand that was the perfect combination of adventure and relaxation besides a few work interruptions here and there! One of my favorite places we stayed at was called the Split Apple Retreat. It's this amazing luxury dream home turned 'retreat' where the two hosts, Pen and Lee, treat you to the most magical views, luxurious accommodations and nutrient dense food. I spent my last day here in the kitchen with Pen learning some of her tricks and favorite recipes. Every morning at the retreat, we would wake up to a delicious almond/coconut milk latte accompanied by local fresh fruits and their homemade coconut yogurt and granola. I knew this was something I would have to make coming back home in NYC! I've always avoided yogurt because it's typically full of sugar and the alternative milk yogurts in NYC are SO expensive. But you can make this one for a fraction of the cost. The only thing to note on ingredients, is that I've found the consistency of the carton coconut cream brands to be much better and easier for making coconut yogurt than the cans (I used this one!). Part of the issue is that the cans tend to have a lot of excess water, there can be clumps / grains and the consistency is difficult to get smooth. The takeaway here is to use coconut cream that's creamy and smooth! These carton coconut milks are great, cheaper than the cans and are likely what makes this yogurt so easy to make! As it relates to the probiotic, make sure you're using a high quality probiotic with at least 40 billion cultures of bacteria. 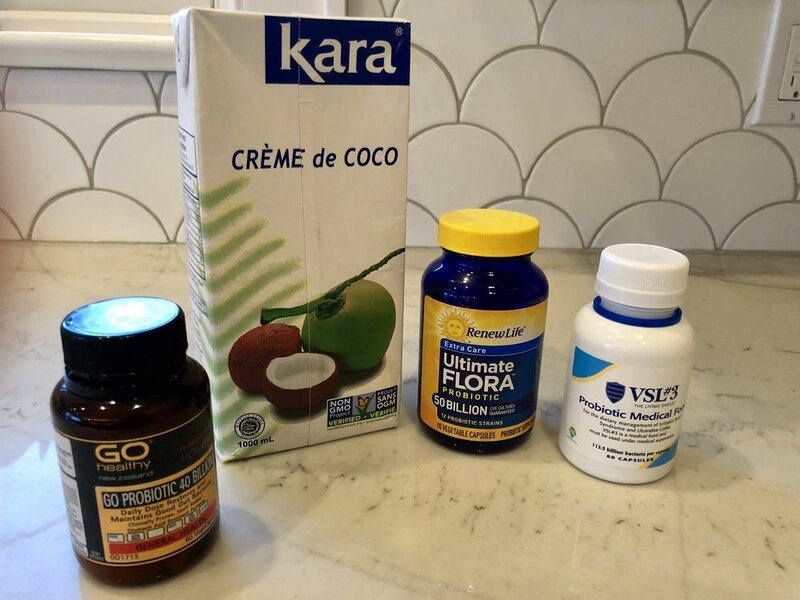 Some of the probiotics on the store shelves don't have live bacteria, which means you won't be able to correctly start the fermentation process and you'll end up with spoiled coconut cream! Lastly, the other important part of this recipe is to make sure to store the yogurt for the first 24 hours in a warm place but not in a location that's too hot to actually 'cook' / kill the bacteria. The only warm place I could find in my house was the electrical closet - and that did just the trick! So find a place to store the yogurt that's at least 75 degrees but not so hot it will kill the bacteria. Put a cheesecloth or paper towel (to let air out but not the bugs in!) and rubber band over the top of your glass container and store in a warm location for at least 24 hours stirring at least once at the halfway point. Feel free to leave up to 48 hours for even tangier and thicker yogurt, but note the yogurt will thicken up a bit after you store in the refrigerator. To make vanilla coconut yogurt, now add the vanilla. If you want a sweeter version you can also add honey or maple syrup. The possibilities are endless! The "GO Healthy" Probiotic I got from New Zealand, but the other two should work fine too. Just make sure you trust the bacteria are actually alive! Note that all of these brands have to be stored in the fridge for that reason. The final result topped with a generous amount of my homemade granola!